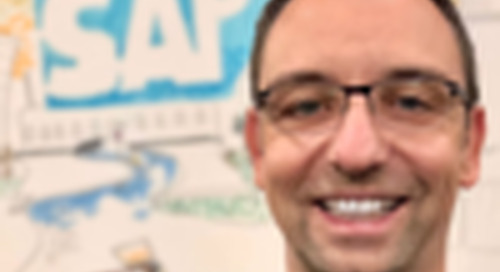 I recently talked with Sreedhar Muthuramalingam, the package owner for SAP BI Adoption RDS, about the story behind SAP’s top selling RDS offering. BI Adoption RDS launched in q4 2012, and has grown to include a full range of pre-built content across multiple LoBs and industries with quarterly releases, over the last two years. What am I going to do with all of these tools? When BI Adoption RDS came to exist, customers were using a variety of tools, primarily Business Explorer (BEx), available to SAP BI users through the SAP GUI, to develop ad hoc queries and perform analysis of query results. that would show our customers what they can do with the variety of tools. Everybody understands Microsoft Office, for instance. You’ve got Word for documents, Excel for spreadsheets, PowerPoint for presentations, and no one has to educate customers on why they need different tools. With BI, it’s the same thing. We have multiple tools – we have WebI and Crystal, we have Dashboards, we have Analysis Office, we have Explorer, and now we have Lumira. What is it that each of the tools do, and why do we have so many tools? Well, you’ve got to use the right tool for the right job. You wouldn’t use a screwdriver to pound nails, or to cut a piece of wood, true? (It’s been done, but we see the point). We do this by delivering an enterprise business intelligence solution (SAP BusinessObjects BI 4.1) that gives users the power to engage with all their data, on any device, across any platform, in real-time. If you want to do ad hoc or detailed reporting, then WebI and analysis are the way to go. If you want to do dashboards, then you have Dashboards and Design Studio. If you want to do data discovery, then you’ve got Lumira. Customers need to be agile and able to react more quickly to market and customer demands. Also the need to have more employees in the organization evaluate data becomes possible with reports rendered across multiple devices, including mobile. Robert: So the primary agenda for the solution was to help customers understand the toolset? Sreedhar: That’s the entire agenda. We were trying to educate the community about which type of tool to use for which kind of report, and which tool is good for which type of user. BI is the product and the BI Adoption RDS demonstrates its endless possibilities. We back you with content so that you can get started quickly with your BI environment. Robert: It’s all about content, isn’t it? Sreedhar: That’s essentially what we’ve done with BI Adoption RDS. Customers love meaningful content, and we’ve created a ton of content across lines of business and industries. It’s a great start for anyone deploying BI from scratch. Of course it can also complement an existing BI implementation. And over the last year or so, BI Adoption RDS has grown to include more business areas, and about 125+ reports that you can interact with on either desktop or mobile. We’ve also tried to create a rich blend of content that will suit everybody. Keep in mind that with BI, reporting is never a destination, It’s a journey. You provide a common starting point, and every customer will have a different perspective on what’s needed next. I want these KPIs, I need this visualization…those refinements only happen with usage. The BI Adoption RDS includes software content, knowledge content and engineered services software content. Software content refers to the preconfigured dashboards and reports, knowledge content includes the best practices guidelines, and engineered services content helps customers get up and running quickly. These three areas are the heart of any rapid-deployment solution. Sreedhar: The RDS content covers an enormous range of business analytics, including financial, manufacturing, purchasing, sales, CRM, human resources, and also provides a suite of executive or CEO reports. Additionally, we also have data analytics for our customers which helps them understand when and how data was loaded with availability, lineage and reconciliation reporting – it’s critically important to gauge the accuracy and reliability of your reports. User adoption is the key to a good BI environment and has always been a challenge. As the saying goes, in God we trust; for everything else we need data. Show me the data. That’s why we decided to build a suite of reconciliation reports to help increase user trust. Even better, when business users are able to validate the data on their own, the process becomes completely self-service for the organization. Robert: How do the reporting areas align with the toolset? Sreedhar: Of course all of the analytics use the right tools for the job. We provide business analytics for Analysis (Office integration), Crystal, Dashboards, Design Studio, Explorer, Lumira and Web Intelligence. In many cases, it makes sense to look at a topic with multiple tools, since each tool can provide a valuable perspective depending on the type of user, and we’ve done that as well, with profitability analysis, for instance. While an executive needs a high-level dashboard, an analyst might be looking at it from a data discovery standpoint. Robert: What about delivery of the solution? How long does it normally take to deploy BI Adoption RDS? Sreedhar: There’s quite a large WBS matrix because of all of the different customer environments that we support. However, delivery times have never been a challenge. If the customer has the underlying software already installed, the go-live for BI Adoption RDS can be a matter of days. Most of the time, though, there’s some effort involved with installation, upgrades, migration, and so on, before we activate the business content. That’s usually because the customer would like to see certain types of visualizations, leverage HANA capabilities, integrate with a predictive analytics solution, etc. Robert: What would you say are the standout reports in BI Adoption RDS? Sreedhar: A prebuilt data reconciliation report is something customers have never had in the past. It’s incredibly valuable for customers to have a single report that compares data from the BusinessObjects layer down to the original data in ECC. And the data lineage report is also great because it clearly shows the sources of data. All these reports really help the users build trust around their data, which is critical for business decisions. And of course all of the line of business reports we created help customers get started without having to create these reports from scratch, are excellent. The savings in time, effort and cost here are enormous. Robert: Are there any interesting customer success stories you can share? Sreedhar: RustOleum is a great story because it’s a case of a customer who went live with the pre-delivered assets without modifications. We’ve taken so much care in building our content, and the fact that we could sit with the customer and implement without a single modification proved that we’re on the right track. As well, while the initial implementation was for purchasing, their sales and finance teams came back and said that they wanted those reports too. downloaded the solution. That goes to the key benefit that you don’t need to take the reports and go live with them as is. There’s a beautiful reporting and visualization front-end view to start off with; customers with concerns about the variety reporting tools were able to look at the content and take it from there by themselves. This is especially true for existing customers moving from BEx to BusinessObjects; for them, this became a great package for examples, or for a proof-of-concept. The predefined content is perfect for new BW customers. Robert: If people want more info or detail, where can they go? Sreedhar: The best place to start is SAP service marketplace – http://service.sap.com/rds-bia, where you can look at the solution and download content. As well, a trial version of BI Adoption RDS is available on the SAP demo cloud, here: https://www.sapdemostore.com/scenario/9191. Sreedhar Muthuramalingam is currently Director - Rapid Deployment Solutions, Business Analytics at SAP Labs. He is the package cluster lead for all BW/BI related RDS packages. Sreedhar is a seasoned SAP veteran with an overall 18+ years of experience on SAP, comprising of 15+ years of SAP BW in it and has implemented BW in major clients like NIKE, EBay and Newell Rubbermaid.